One of the most common concerns voiced by people considering bankruptcy is “Will I be able to get credit after bankruptcy?” It’s an important question even for those who have vowed never again to carry a credit card balance. Credit scores impact access to loans for big ticket items, such as homes and cars. They play a key role in determining the cost of those loans, and many other costs, too. Your credit score can impact your ability to rent an apartment, and affect the rates you pay for automobile insurance. In short, your credit score matters, even if you plan to live post-bankruptcy life debt free. While bankruptcy is obviously a negative item on anyone’s credit report, you may be surprised to learn how bankruptcy impacts credit scores, access to credit, and the price of financing a big-ticket item or taking out a personal loan. A 2014 report from the Federal Reserve Bank of Philadelphia revealed that average credit scores increased from the time of filing bankruptcy to just after discharge. And, the average improvement was significant. The dividing line between bad credit and good–at least, for the purposes of obtaining many types of loans–is about 640. As the table above shows, the average bankruptcy filer enters bankruptcy well below that level, but emerges with 640 credit score in reach. LendingTree, an internet lending exchange, recently reviewed credit data, loan approval, and the cost of various types of credit for more than 1 million 2017 applicants. 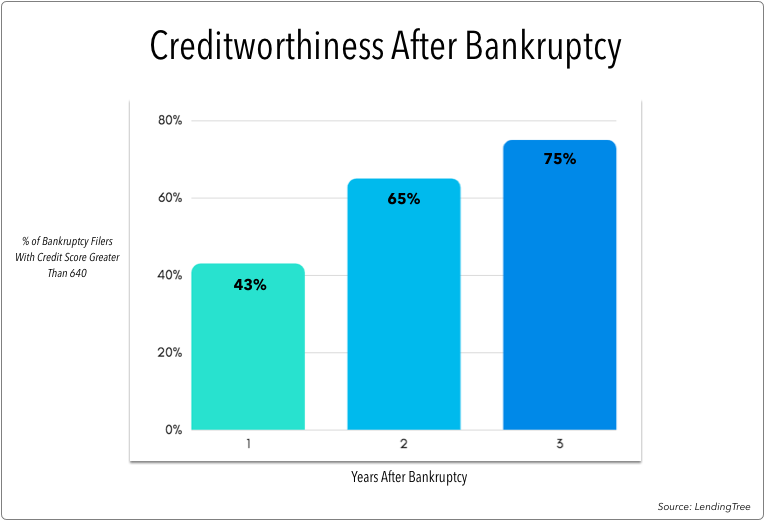 One question analysts set out to answer was “How many bankruptcy petitioners reach or exceed a 640 credit score after filing for bankruptcy? Five years after bankruptcy, a full 3/4 of bankruptcy filers whose files were reviewed had credit scores of 640 or higher. And, many reach that level much sooner–43% in just one year. LendingTree reported that some users credit scores reached 740 or above within one year after bankruptcy. The bottom line: bankruptcy needn’t be fatal to your credit, and can even provide an initial boost to an already-flagging credit score. The study also provided encouraging data regarding the cost of loans post-bankruptcy. In the next post, we’ll look at the impact of bankruptcy on automobile loan pricing.